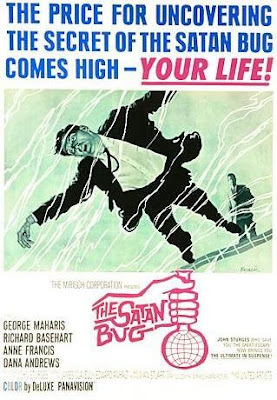 BLACK HOLE REVIEWS: They've released THE SATAN BUG (1965) in the US! Before Michael Crichton’s The Andromeda Strain, before Outbreak, The Satan Bug was a gripping 'viral' thriller, based on Alistair Maclean’s best-selling novel. 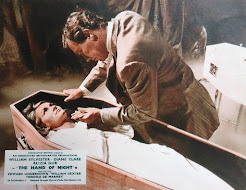 Through the 1960s and 70s, Maclean's books inspired a string of hit movies. The author's name on a poster promised adventure and man-centric thrills. As you can see, his stories ranged from World War II heroics, through cold war thrillers, to high-tech terrorism. 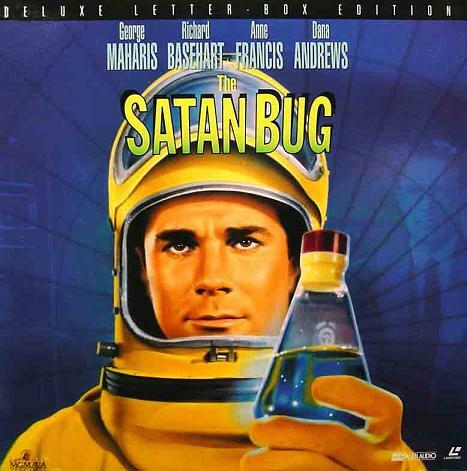 Which brings us back to The Satan Bug, which Maclean wrote under a pen-name and isn’t actually credited in the film. This is a well-made, tight detective thriller with a slight sci-fi edge (that is if the science of such a bio-weapon is still fictional). 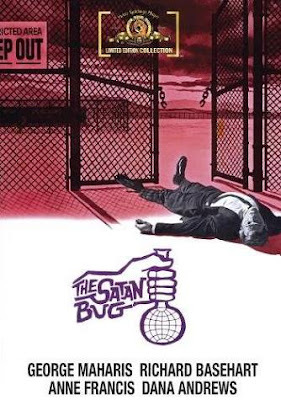 The 'Satan Bug' is a virus engineered by the government to kill all living things, a sword of Damacles in a top secret lab in the Nevada desert. 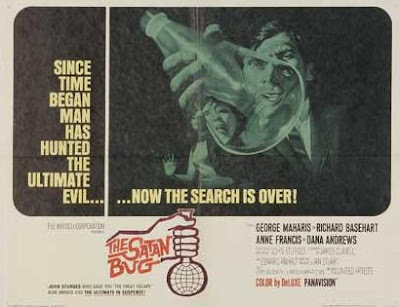 Then the bug goes missing, along with another less deadly virus. So the story starts with a typical ‘locked room’ murder mystery – a well-guarded bunker with a huge combination locked laboratory. How did the thieves get in, let alone escape? The story depends on the audience paying attention, keeping track of a dozen different suspects, all men in suits. Dialogue drives much of the complex plot with many crucial events, even the opening murders, all happening off-screen. The early detective work has the benefit of the spectacular scenery of the desert mountains, and the action eventually takes off. But with a premise like this, it's suspenseful throughout. The film is helped enormously by an outstanding early score from Jerry Goldsmith, his first sci-fi soundtrack, using unusual percussion and electronic sounds. The opening title theme is very striking and suitably downbeat. The director, John Sturges, was the man behind Christmas TV hardy perennials The Magnificent Seven and The Great Escape, as well as many other well-known thrillers. He does well to keep the tension persistent and the settings familiar. The cast also make this a pleasurable watch, with the late Anne Francis as intelligent eye candy – good to see her in something besides Forbidden Planet. An elderly Dana Andrews (Night of the Demon, Zero Hour, Crack In The World) coordinates the search for the virus, and Richard Basehart (Voyage to the Bottom of the Sea) plays the head of the scientific team (below). 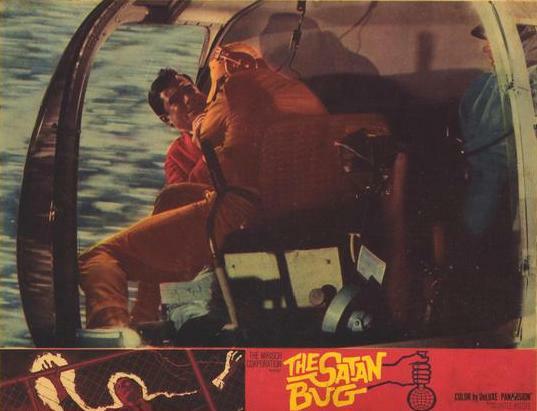 There are also a couple of great-looking helicopters in the film, a regular feature in Alistair Maclean films, just because they were standard issue in thrillers at the time - visual shorthand for ‘high-tech’ and ‘big budget’. 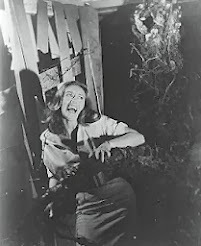 The US VHS release was severely ‘panned & scanned’ down to a tight 1.33 full frame. The first widescreen release was the Fox Laserdisc. In 2007, I was pleased to find the film on DVD in Denmark and Norway, in 2.35 anamorphic widescreen. However, the picture didn't look much better than an (analogue) laserdisc. There was visible patterning, with hard diagonals turned into a series of steps (see the edge of the desk, above). It’s only distracting on certain scenes, but there’s also slightly muffled audio - not something I'd expect on a digital release. My mistake, perhaps, and at least this is a chance for the US to see a great sixties thriller in widescreen, on DVD for the first time. Lastly, there's an original trailer on YouTube. This is great news for a really entertaining flick. I'm a little disappointed in this new proclivity for issuing movies on "made to order" DVD-R media, though. I've got several DVD units in my home but only one of them can play the Warner Bros. discs because they won't play in a drive that can also record. I'm not a video pirate, but I guess there's enough of it going on that they have to protect their product. I've had no problems playing Warner DVD-R discs in DVD players. My main concern is the format's longevity compared to standard factory-pressed DVDs - only time will tell. A comment on Warner Archive's Twitter feed hinted that their bestselling titles might possibly get proper releases. Yes, it's very disappointing to read that this release is not up to the usual WA standard...okay some of their discs (such as some of the Tarzan's) maybe haven't looked all that great, but in the main, complaints have been few and far between (eg. THE CYCLOPS). I wonder if this is any better (or maybe even worse) than some of the earlier PAL releases from Italy etc? Sounds like a fun little movie, and I'm tempted, but these new DVD-R releases really are wildly overpriced. If I gave the impression it's a 'little' movie, I've failed! 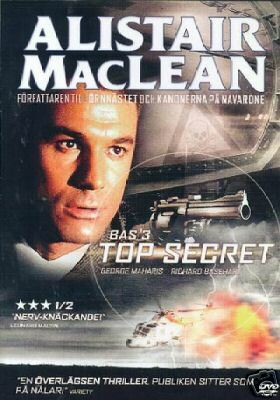 Compared to the witty James Bond/Derek Flint superspies, MacLean wrote tough humourless characters, set in far more realistic worlds of espionage. I deliberately compared this to Outbreak and The Andromeda Strain because they're the closest fit in terms of tone - a deadly threat to life on Earth and a race against time. Anyhow, you're right about the prices - I'd buy far more films speculatively if they were cheaper. At present I'm just getting my must-haves. Hopefully, if there was a better master out there, MGM would have used it. It's bizarre how some major moneyspinning hits just get left behind. I have just purchased the Turner Classic Movies made-on-demand DVD. I bought it while it was being broadcast on TCM-HD (via Charter on our cable service) on December 21, 2012, and it looked beautiful there. I phoned them to ask if the DVD would look as good as the broadcast. They seemed to say "yes," suggesting it had been "re-mastered" and the copies would be made from the re-mastered version. I don't know whether it will reflect the treatment given films re-mastered by Criterion. I will see when it arrives and I've viewed it, then I'll report back here. I'm looking most interestedly for the cinematography in the desert scenes. I haven't found out yet where it was filmed, but I'm thinking California, not Nevada. The house used in some scenes in the desert looks like a famous architect's design. I've just purchased the TCM made-on-demand version of this film while watching it yesterday, Dec. 21, 2012 on TCM. I phoned TCM first to see if the DVD would reflect the beautiful version I was watching at the time in HD. They said "yes," suggesting it had been re-mastered. We shall see, and I'll report back here. 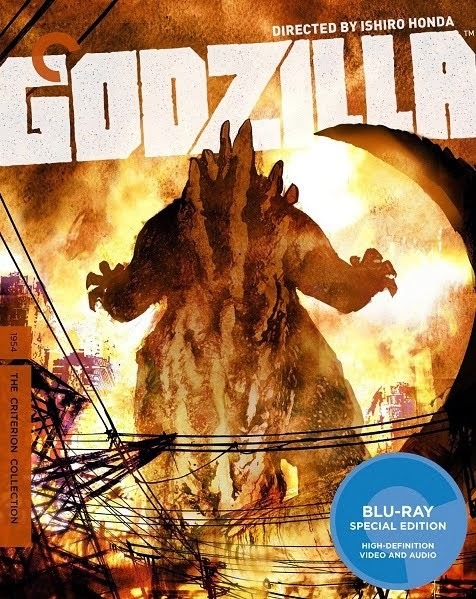 Coming to BLU RAY this September 2015 from Kino!!!! Yup, once more my hopes are up for decent remastering of this thriller.